NOTE: This story explores a day inside charter school International Academy of Flint and is part of a larger series on charter and traditional school performance in Genesee County. 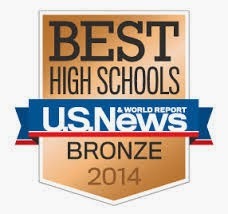 International Academy is ranked by the state as the top-performing charter school in the county. Check back soon for a profile of Academy of Flint, which ranks as the lowest-performing charter school. GENESEE COUNTY, Michigan — In a second-floor classroom on the south side of Flint, a group of fourth graders — most wearing maroon-colored polo shirts — stand at attention facing the American flag, reciting the final words of the Pledge of Allegiance in unison. They've filled out their daily diaries and heard the morning announcements. Teacher Angie Cox already got after a few for having a shirt untucked. The pledge ends and the students remain standing. More words — set to a similar sharp and punctuated cadence — come through the public address system and the students join in. "We are students at the International Academy of Flint, we can make a difference ..."
It's the beginning of another day in what the state's education department calls the highest-performing charter school in Genesee County. "I think there's a lot of things going for us," said Melissa Vincent, who serves the middle school grades as the academic quality coordinator (think principal but with more time focused on testing and curriculum). The data supports Vincent's comment. The K-12 school landed as the top charter in the county on the Michigan Department of Education's top-to-bottom list last year, which ranks all schools in the state based on student proficiency, school achievement, academic growth and the socioeconomic gap in five subject areas plus high school graduation rates. In that same ranking, it was the only Genesee County Charter to beat the average for the county's 123 public schools. It was also the only charter to top the state average. In November, the state included International Academy on their list of 123 schools "beating the odds," by "outperforming schools with similar risk factors and demographic composition." Also, the school's third though eighth graders outperformed both the county average and the Flint School District and was the top charter in the county in math and reading on the most recent results from state tests. Testing, said Vincent. A lot of it. "We start testing regularly in first grade, then it just gets more intense as they get older," she said. She points to a testing schedule for fourth graders this semester. There is some type of exam nearly every day in subjects like Spanish, writing, English, science, vocabulary, math and grammar. A favorite room of hers to show off is the exam hall. Here, row after row of benches hold computers and monitors under special privacy shields, about 130 in all. The building gets daily use and teachers get immediate results. If Vincent sees a certain student isn't doing well in a Science, she tells the teacher to focus on them. Or maybe a lot of students are missing questions about photosynthesis: time to spend some class time reviewing it. "Because we're testing a lot more, we're able to see if the kids are mastering the concepts," Vincent said. It's also designed to prepare students for the test-heavy environment they can expect in college, said school spokesman Art Wenzlaff. "Treat them like they're going to be treated in college," he said, with an extra emphasis on the words "going to." All International Academy students are required to produce a college acceptance letter to graduate. Walking through the school's hallways (the building once housed Flint's Lincoln Elementary), the signs of college prep culture are everywhere. "We will go to college in 2024," reads a sign posted outside a kindergarten classroom. In the 12th-grade hallway, colorful banners with names of colleges hang on the wall above students' lockers. It marks where the student has been accepted. The typical criticisms of charter schools — they serve few special education students, they don't provide transportation, they save money by not serving high school grades — don't apply at International. Of the district's roughly 1,200 students, nearly one in ten have special needs, according to the state's education department. And the school contracts with Mass Transportation Authority for student transportation. There is another quirk to International Academy, one that likely plays a part in their robust test scores. All new students take a test before setting a foot in a classroom. "We'll make a grade level placement based on where they test," Vincent said. It isn't unusual for students to be placed a few grades below where they were in their last school. At the beginning of each year, typically 15-20 percent of new students test below the grade they expected to be in, she added. School officials say being in a lower grade doesn't have the same stigma as in other schools because so many students are subject to it.